Well, hello, everyone! Broni here, and I'm your host today! I've got a neat little card to show you, so let's get to it! I was playing around with my #5 manila tags the other day and decided to use Sherry's Wrinkle-Free Distress technique with my new Ranger Distress Summer 2012 colors. Love that "picked raspberry"! Well, as I was drying the tag after dipping it into the ink, I decided I wanted to have some drips running down the tag. I'm not a very patient artist, so to get the drips to "run faster" I used my Copic airbrush system (with no Copic inserted) to speed them up. It worked perfectly! 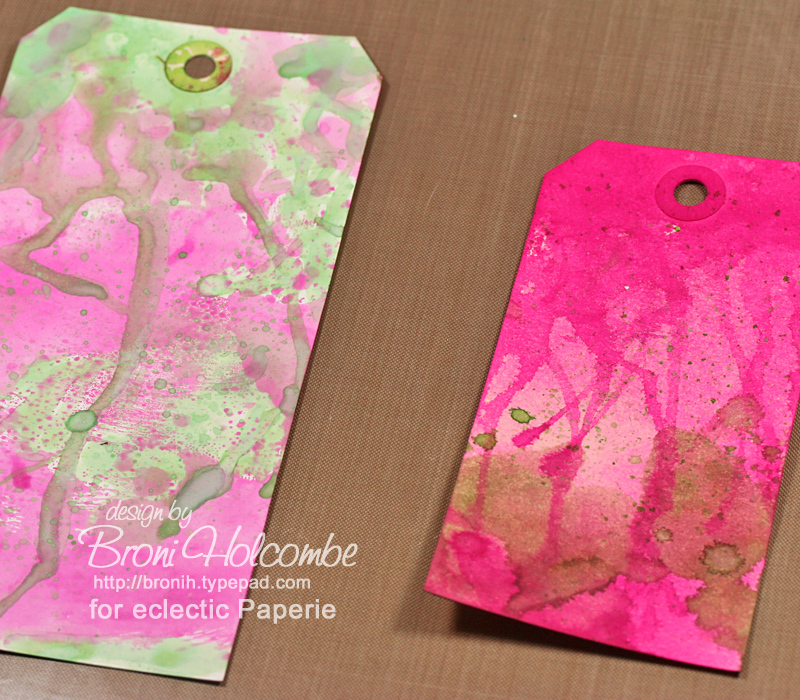 And I soaked up the extra ink onto a white cardstock tag as well. Just look at the difference of the colors on the manila versus the white tag. Pretty cool, huh? So how did I incorporate the tag onto my card? By using it as the backdrop for my coffee cup and sentiment from the Daily Grind stamp set from Market Street Stamps. I also used my Dylusions Dotted Flowers stencil to add some dots to the patterned paper from the Graphic 45 A Lady's Diary collection. And let's not forget that yummy twine from the Twinery that topped it all off! Here's a side view closeup of the dimension of the layers. Can you tell I love my foam mounting tape? That's all I have for you today! Check back in on Monday for a new post from Julie! Look at you gettin' all artsy! I love this, Broni! 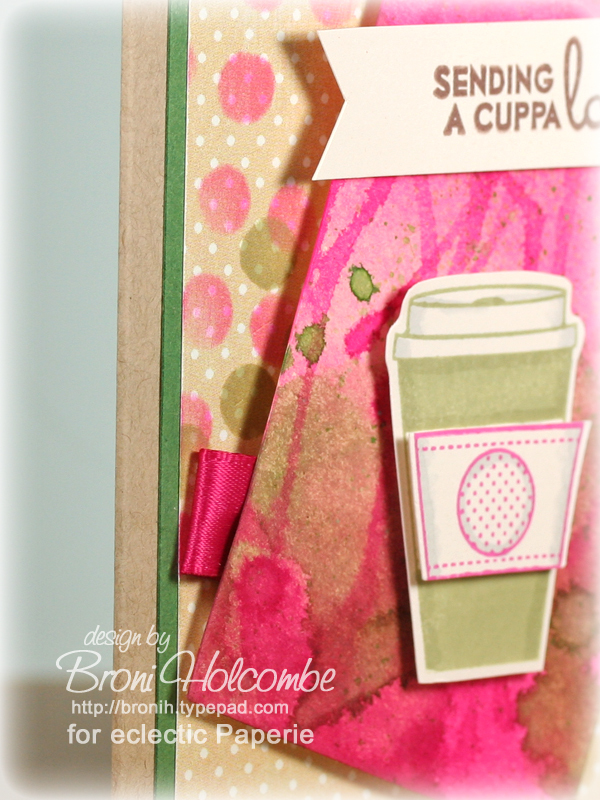 That tag is gorgeous and that dotted background is just the right mix of color and pattern! Love those colors, Broni...wish we could have met at Charlotte CKC! 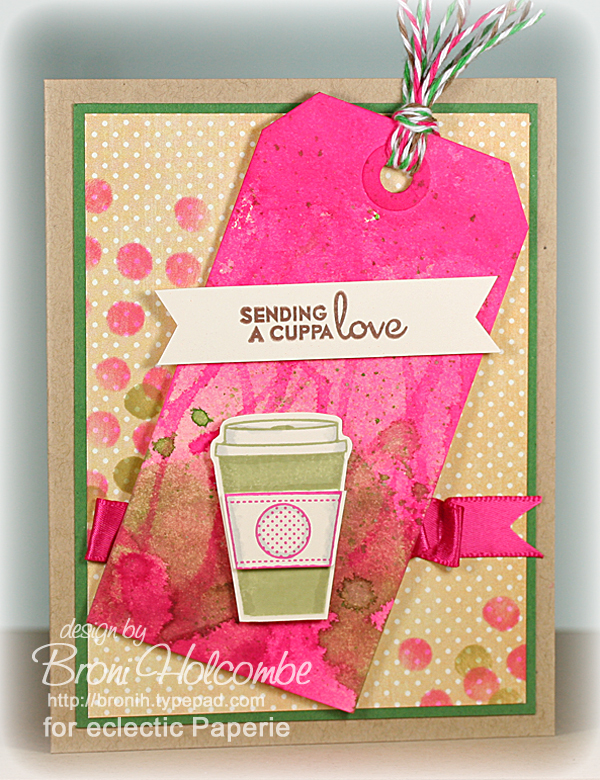 Super cute and creative, Broni! Fab idea to incorporate that gorgeous colorful tag...LOVE IT!!! This is so precious, Broni! I love your background with Sherry's technique. Great idea with the air brush system to hurry the drips up. Gotta try that. Love that wrinkle free technique. My problem is that I can't ever stop and have oodles and oodles of papers. Gorgeous card. Hi Broni, I am playing catch up with all the blogs from eP. Love this card and your techniques. Thanks for sharing.